Thank you Blue Diamond Almond Breeze Almondmilk for sponsoring this post. 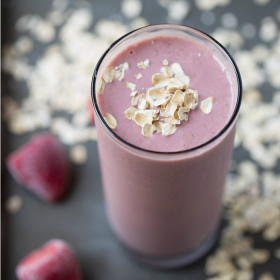 This Strawberry Banana Oatmeal Protein is super thick, creamy and will keep you full until lunchtime. Use gluten free oats to keep it gluten free! It’s a smoothie-licious kind of day. The smoothies that I bring into this world rarely contain dairy. First, milk is my stomach’s arch nemesis. My stomach and milk have duked it out many times. As a result, milk often wins the battle and I end up with a stomach ache. However, if I utilize the Lactaid super power, I’m usually okay with milk. Lactaid helps me destroy milk’s evil, destructive digestive destroyer lactose. BUT, I don’t really like taking lactaid. And I don’t like nasty battles, so I play it safe and make non-dairy smoothies. 1 scoop plant based vanilla protein powder. Vega brand is my fav. This smoothie is bananas amazing! I love the oatmeal!!!! LOL! I love it, Jocelyn – banana’s amazing. :) Thank you! Sounds like the perfect 7am breakfast to get me going! 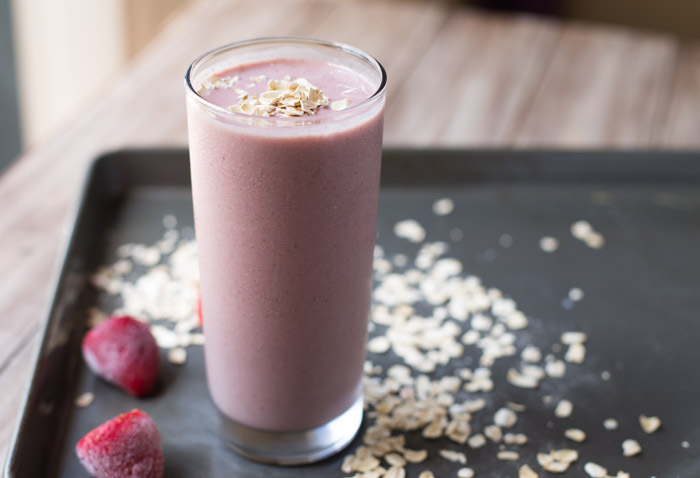 I LOVE adding oatmeal to my smoothie recipes, it helps fill me up! I am totally obsessed with the Touch of Honey Almond Breeze, so I am ALL over this blendy goodness! Pinned! The oatmeal is great because it makes a smoothie so much thicker and richer and it’s absolutely filling, too! The touch of honey almond milk is my new fav and now I am on a mission to find it in my grocery store – it wasn’t on the shelves when I checked today. Boo! Thanks for the pin, Taylor! I love Blue Diamond almond milk and this smoothie looks delicious! Perfect for breakfast or afternoon snack! Sounds and looks really great! Love adding oatmeal to smoothies. Yum! Nicely done! 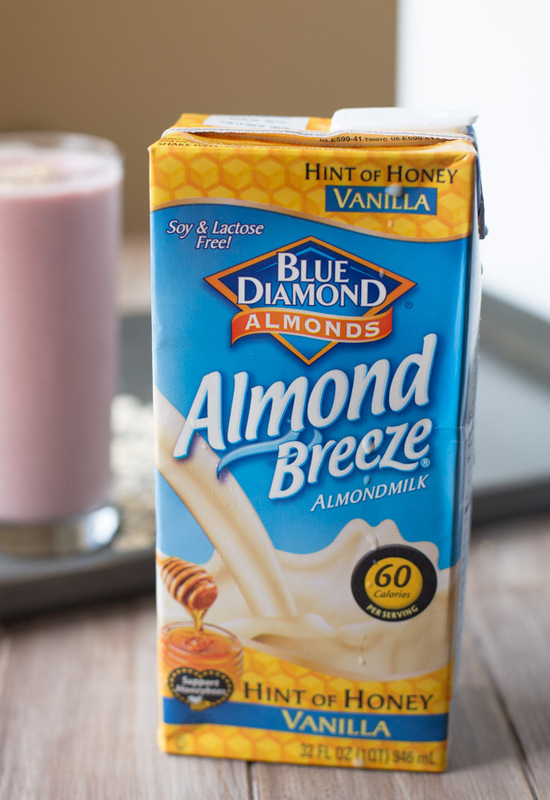 I’m a HUGE fan of Blue Diamond Almondmilk…my favorite is Unsweetened Vanilla! Thank you, Cali! I love the Unsweetened Vanilla, too! Great smoothie! Pinned this for later! Congrats on being a Blue Diamond Tastemaker!!! love it!!! and I LOVE this smoothie!!! must try this one soon!!! Happy Sunday, Julie!! Thank you, Alice. :) Hope you have a great week! I just discovered the idea of oatmeal in a smoothie. I know. I know. I’m slow. But I didn’t have a nutribullet till recently. Now life is a little different. Thank you for the reminder about Almond milk in smoothies. I will have to pick up a container. I always have strawberries on hand. I only started using oatmeal in smoothies recently, so I was a little slow, too. :) Hope you enjoy the almond milk in the smoothies. The hint of honey is great so if you can find it, I definitely recommend giving it a try. Oh Julie, this looks absolutely amazing! I need that almond milk in my life stat. A touch of honey? Uh yeah sign me up! And strawberry banana anything for life! It’s great, Mary Frances. The only downfall is that I haven’t been able to find it at any of the stores around my house! This smoothie sounds amazing! 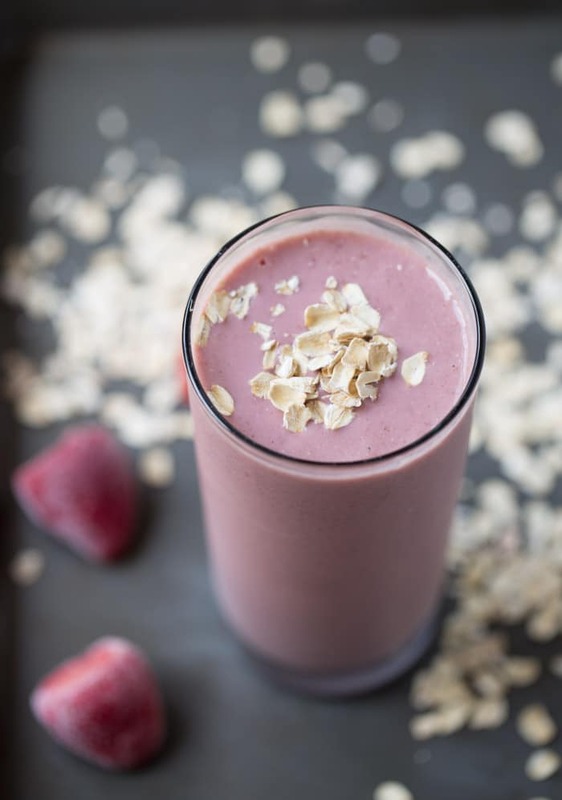 I always love adding oats to my smoothies too! Yum!